When I can I start building Krustyland? Before the Springfield Squidport was added, there was already plenty of things to do in Springfield. It was tricky enough to balance building a town and a boardwalk, but now you also have the option of building your own amusement park. To start your Krustyland journey you need to be at Level 20 or higher. You will also need $50,000 to buy the Krustyland Shuttle, the building that allows you to leave Springfield and enter Krustyland. This will be your gateway between the two maps. Only a select few Springfield residents can enter Krustyland. 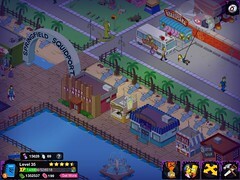 If they are not working on a task in Springfield, they will automatically appear in Krustyland.